shows 24 HR time. Tap mode to change to stopwatch, start/stop and reset. Tap weather to refresh usually take about 30 seconds. Tap Ambient to scroll through lume options. Shows next 2 calendar events. Shows todays date. Tap digital time to change hand colors from white, yellow and blue. Tap center of watch to make hands temporarily disappear courtesy Ram Mor. Tap date to go through 4step darkness filter, 4th tap is completely dark "Theater Mode". 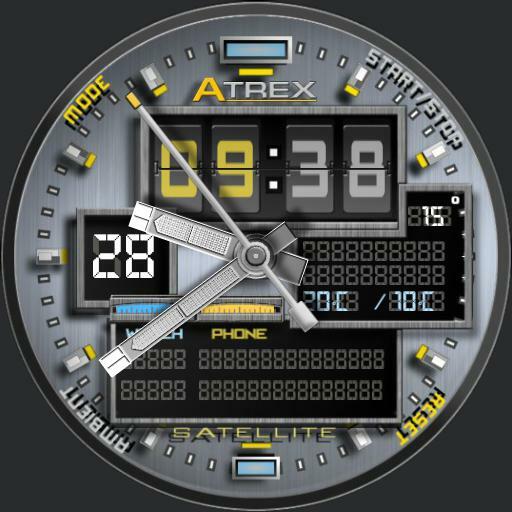 Shows watch and phone battery level.